Since their discovery in 1895 by Wilhelm Conrad Röntgen, X-rays have played a crucial role in essentially all areas of basic and applied science with tremendous impact on biology and medicine. Twenty Nobel Prizes in Physics, Chemistry and Medicine have been awarded for studies with X-rays, starting with W.C. Röntgen’s first Prize in Physics in 1901. Up to the present day and with ever-increasing impact, imaging and investigations of structural and electronic properties of matter have remained of prime interest for forefront research and applications in physics, chemistry and biology. After the first observation of “synchrotron” radiation in 1947, progress over the past 60 years has very much been driven by the enormous gain in brilliance of synchrotron radiation provided by electron storage rings, allowing for exciting views into the structure of matter. Here, most frontline X-ray studies explore static, i.e. time independent, ground-state properties of complex systems including large molecular machines that are of paramount importance for biology. Recently developed next-generation accelerator based light sources, the X-ray Free-Electron Lasers (XFEL), surpass the peak brilliance of state-of-the-art electron storage rings by one billion at pulse durations of about 1 to 300 fs, which is up to ten thousand times shorter than what is presently available. Moreover, the light is fully coherent along the lateral directions and partially along the longitudinal direction enabling innovative imaging schemes. Beams of adjustable wavelength are provided in sequences of ultrashort pulses containing about 1012 photons each. By comparison, a full second is necessary to get this many photons from today’s best synchrotron radiation facilities. Therefore, this is a groundbreaking revolution in X-ray science. The gain in peak brilliance, along with the ultrashort duration of the light-flashes, allows scientists, for the first time, to study the dynamics of complex systems with atomic resolution in space and time. Thus, this new era in science will be characterized by taking “movies” instead of “pictures”, by exploring “dynamics and function” instead of “static structure”. The goal is to understand and ultimately control the “functioning” of matter, of biological systems and drugs, of correlated materials, of chemical reactions or of nanostructures. Professor R. J. Dwayne Miller, CFEL division leader, speaker of CUI and director at the Max Planck Institute for the Structure and Dynamics of Matter, Hamburg, will be honored with the 2015 E. Bright Wilson Award in Spectroscopy of the American Chemical Society (ACS). Miller’s work on atomically resolving structural dynamics, aka making molecular movies, has created a new field in which all researchers worldwide can aspire to see chemistry in action. And which could very well change the way we think about chemistry. Prof. Dr. Andrea Cavalleri CFEL Scientist and Executive Director of the Max Planck Institute for the structure and dynamics of matter (MPSD) receives the German-British award. In his research Andrea Cavalleri combines condensed matter physics with time-resolved optical spectroscopy and x-ray science. His work focusses on the light-driven control of the closely-related electrical, magnetic and structural properties of strongly correlated electronic systems. Cavalleri uses femtosecond x-ray pulses to gain new insight into the dynamics of phase transitions in these systems on their elementary time scale. On 17th of June, 2013 the new CFEL research building was officially inaugurated. From then on the newest architectural landmark on DESY’s Hamburg campus opened its doors to scientists. 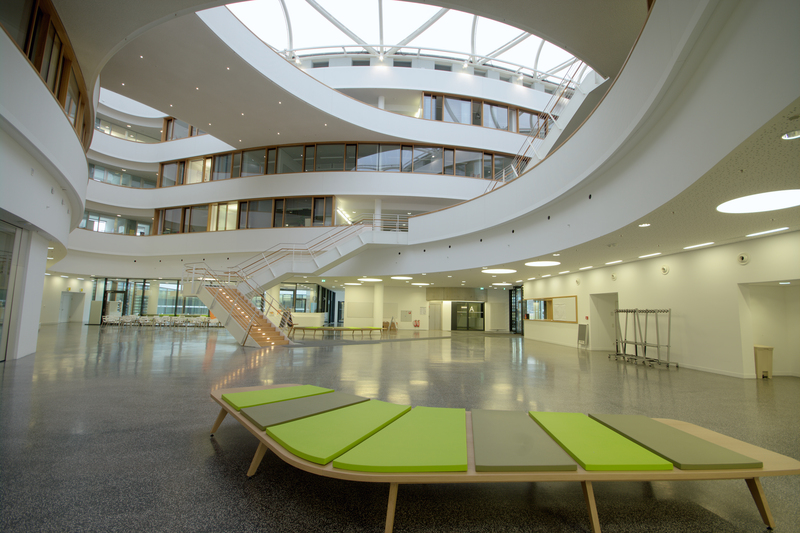 After more than three years of construction, the new building of the Center for Free-Electron Laser Science (CFEL) was handed over to Hamburg University. The eye-catching facility – located across the street from the PETRA III experimental hall – comes with four thousand square meters of office space, approximately the same amount for laboratories, four hundred square meters for scientific meetings, and its own cafeteria. Scientists at CFEL, a scientific collaboration between DESY, the Max Planck Society, and Hamburg University, pursue research with modern light sources such as free-electron lasers. These devices produce ultra-short and ultra-intense light pulses, creating unprecedented perspectives in Physics, Biology, Chemistry, Material Science, and several other areas. CFEL groups have been working at DESY in temporary offices since early 2008. CFEL’s home has been designed by the Stuttgart architects hammeskrause. The building’s impressive transparent roof creates a vast open space at the center of the building with the offices arranged around it in a concentric fashion. “Open spaces have been emphasized to create synergies between the various research groups and to foster communication among scientists,” the architects state on their website. The design of the CFEL complex also implements a variety of “green” concepts. “Plants on the building’s laboratory roofs, for instance, make up for vegetation that had to be removed during construction,” Köhn explains. “Moreover, water from one hundred meters below ground level is pumped through the office ceilings to help cool down offices in the summer and heat them in the winter.” This strategy keeps the building at a moderate temperature all year long and lowers heating costs in the wintertime. The new facility equips scientists with twenty-one state-of-the-art laser laboratories, which are strictly vibration-cushioned and temperature-controlled. A ventilation and air-conditioning installation the size of an indoor soccer field and additional separate air-conditioning systems in the building’s basement keep the temperature on the experimentalists’ optical tables constant within half a degree. CFEL’s laboratory space is complemented with a clean room, workshops for detector development, chemistry and biochemistry laboratories, and a spacious experimental hall for the assembly of large-scale synchrotron radiation and free-electron laser setups. The construction costs, of approximately forty million euros, have been predominantly covered by the City of Hamburg with additional funds coming from the German federal government. To view the construction's progress from the start please go to CFEL Construction. A first milestone in the construction of the CFEL building was achieved with the laying of the foundation stone on 29 September 2009. Despite the rainy weather approximately 150 people attended the laying of the foundation stone. Dr. Herlind Gundelach, Hamburg’s Senator for Science and Research opened the ceremony with a short greeting. Prof. Dr.-Ing. Hans Siegfried Stiehl, Vice President of the University of Hamburg and Christian Scherf, DESY Director of Administration gave short addresses underlining the importance of CFEL for their institutions. Both speakers acknowledged the city of Hamburg for supporting this new building that enables this interdisciplinary institution to attract the best scientists from all over the world. Prof. Dr. Joachim H. Ullrich, head of the CFEL managing board, head of the MPG-ASG, and director at the MPI for Nuclear Physics in Heidelberg addressed the audience on behalf of the Max Planck Society and CFEL, agreeing with the previous speakers about the importance of CFEL for the three institutions and the city of Hamburg. The four speakers placed the traditional items into a copper time capsule: a local newspaper of the day, current coins, one set of the architects’ drawings of the CFEL building, several scientific papers published by the CFEL group leaders, and two special items related to the CFEL research - the prototype of a pnCCD detector chip for fast X-ray detection and the CFEL logo drilled in a silicon wafer by a focused ion beam. The copper capsule was then sealed and buried in the central ground plate of the building, according to tradition. Finally, the ceremony ended with a small reception in the adjoining PETRA III hall. The concept of a Max Planck Research Group at the University of Hamburg materialized in 2007 with the joint signature of a cooperation contract between the University of Hamburg and the Max Planck Society. In the beginning of the same year, the FEL research activities of several Max Planck Institutes had been joined to form the Advanced Study Group, acting as a key link for future Max Planck FEL activities from all other departments. Following this example, the University of Hamburg decided to concentrate its involvement in FEL research in a second Advanced Study Group. In 2007, these parallel activities were merged. DESY, the Max Planck Society, the University and the City of Hamburg signed a collaboration contract on the establishment and operation of the Center for Free-Electron Laser Science. CFEL, acting across the classical scientific disciplines and, for the first time, across German Science Organizations, was envisioned to provide a novel platform for transforming the technology-driven “X-ray revolution” into a revolution in science and applications at the frontiers of knowledge. CFEL integrates the scientific activities and the expertise in different fields of all founding partners in a coordinated and synergetic effort to create a world-leading center in the field of Free-Electron Laser Science. The organizational chart of CFEL includes several departments and junior research groups provided by the partner organizations DESY, University of Hamburg, and Max Planck Society. DESY is in charge of two experimental and one theory division plus one junior research group. The Max Planck Society and the University of Hamburg jointly support two experimental divisions with three junior research groups. In addition, both institutions operate Advanced Study Groups with two and three junior groups, respectively. Each of the CFEL partner organizations promotes the research and development of high-performance radiation/X-ray detectors. The City of Hamburg is building the CFEL Office and Laboratory Complex. Advised by a Foundation Committee, CFEL was able to attract and appoint leading scientists from all over the world in a highly competitive environment, such that all five divisions and many junior research groups have become fully operational within only three years. CFEL scientists contribute to highest-level teaching and training of students at the University of Hamburg within a DFG-funded Research Training Group and an International Max Planck Research School. In December 2003, after the decision by the German Federal Government to realize the X-ray FEL proposed by DESY as a European project, DESY submitted the vision of a Center for Free-Electron Laser Science (CFEL) for strategic evaluation by the Helmholtz Association of National Research Centers (HGF). In October 2004 the Helmholtz Senate strongly recommended to strengthen DESY’s photon science in-house research through CFEL. This should serve as an anchor point for the preparation of the scientific programs at the Vacuum Ultraviolet Free-Electron Laser (VUV- FEL) and the planned European XFEL Laboratory. At the same time, based on a memorandum to exploit the new challenges posed by XFELs in 2003, the “Perspective Commission” of the Max Planck Society (MPG) recommended entering this innovative field of science in May 2004. Supported by the President’s “Innovation Fond” since 2005, scientists from several Max Planck Institutes have performed pioneering experiments at FELs. Further deliberations led to a recommendation by both the Chemical, Physical and Technical Section as well as the Biological and Medical Sections of the MPG. They advised to establish an interdisciplinary “Max Planck Research Group” together with the University of Hamburg at DESY, including an “Advanced Study Group”.